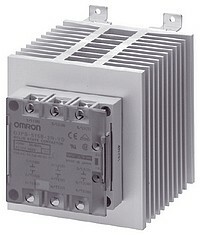 An Omron G3PE three phase (3 switched poles) solid state relay with heat sink for panel or DIN rail mounting. For loads three-phase of 200 to 480Vac, controlled by a 12-24Vdc logic (on/off) signal. This features zero cross over switching. The G3PE series features an original surge-pass circuit that gives outstanding surge endurance and protects the semiconductor device against voltages in excess of 30kV.